No's all around here. Crushed Plum is such an awesome name but it's very much not-plum :< Very lovely, smooth formula though. Missing but worth Googling if you want a super vampy, blackened burgundy: Make Up For Ever Rouge Artist Intense #49. N28's name is Purple, damn it. 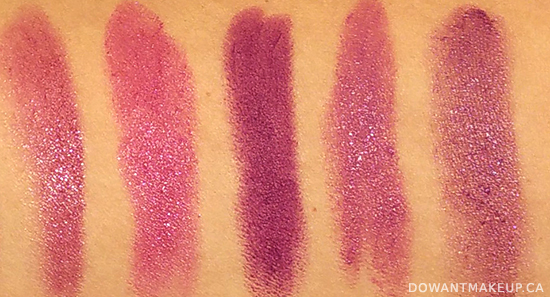 The bullet is quite deep in colour, but it swatches berry. I didn't pick up on the hint in the Natural part of Rouge Artist Natural at the time, but it makes sense that the lipsticks in this line would be more translucent. Shockingly, the ones I really liked out of this bunch were the Sephora Rouge Creams. Both seem a little too red to be my "Goldilocks plum", but they were intense and pretty with just two passes, so I may end up with them anyway. Judging by Googling, neither seem to be getting much attention and therefore I must adopt them and love them. I think I went overkill on the swatching. My head is spinning with plums and berries and I may have just confused myself (remember, makeup magpie = distracted by too many shiny things.) As I wrote this post, I realized that I haven't put much consideration into the fact that your natural lip colour influences the end result quite a bit. My lip colour is deeper and greyer than most people, so things that I initially wrote off as not dark enough or too berry might actually pull just right on me. In the end, even with arm swatches you're only getting half the story. What does this mean? Was this all just a pointless exercise in my habit of over-researching? *shrugs* Well, I squeezed a post out of it and the process introduced me to some lines that weren't on my radar, such as Sephora Rouge Cream and Estee Lauder Pure Color Envy Sculpting. Maybe my perfect plum really is Annabelle's Royale, but it won't stop me from acquiring more shinies--my front runners are Sephora Rouge Creams in Truth or Dare and Crush, and Revlon ColorBurst in Shameless. What lip colour are you obsessed with right now?